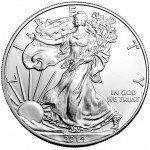 When thinking of national silver bullion coins, the Canadian Maple Leaf and American Eagle immediately come to mind, but there is another that matches the quality of those well-known products. The 2014 1 oz Silver Armenian Noah’s Ark coin is the official silver coin of Armenia and was created in 2011. 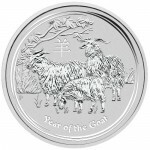 Since it was introduced it has been minted yearly in sizes from 1/4 oz to 5 kilograms. 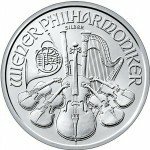 Among the most popular size in the series, however, are the 1 oz weighted coins. Each 2014 1 oz Silver Armenian Noah’s Ark Coin has been struck with .999 pure silver and has a 500 Drams legal tender face value. The story of Noah’s Ark is one of punishment, salvation, and revival. Disappointed with the direction of human society, God chose to punish mankind by unleashing a massive flood to cleanse the Earth. God selected Noah and his family for salvation, instructing them to build a massive ark and collect two of every animal on the planet. Noah’s family survived the flood in the ark and was tasked with rebuilding mankind and the animal world. Armenia is deeply connected to the history of Christianity. The nation was the first in the modern world to recognize Christianity as its official religion. More importantly, Mount Ararat was the resting place of Noah’s Ark when the flood waters receded. Until the early 20th century, Mount Ararat was inside the boundaries of Armenia, but as a result of war the borders were redrawn. The obverse side of the 2014 1 oz Silver Armenian Noah’s Ark coin features the national coat of arms of Armenia. Engravings on this side of the coin include the phrase “Republic of Armenia” in both English and Armenian, as well as the weight, purity, metal content, and year of minting. On the coin’s reverse is the image of Noah’s Ark floating atop the flood waters. In the background, the rising sun can be seen peaking over the top of a mountain range. In the foreground, a single dove flies off the coin with an olive branch in its beak. Engravings on this side include the phrase “Noah’s Ark” in both English and Armenian. 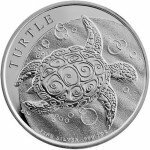 All orders that are placed with Silver.com are packaged with safety and will include full shipping insurance. 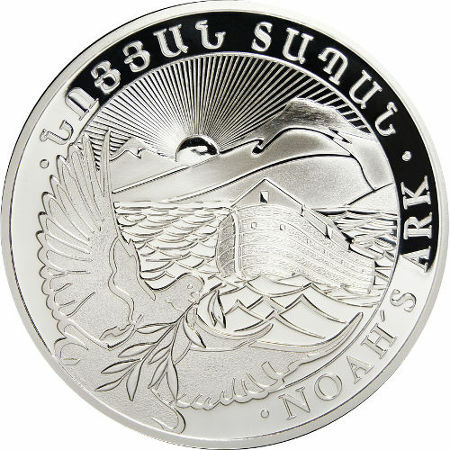 If you should come across any questions about the 2014 1 oz Silver Armenian Noah’s Ark Coins prior to placing your order, please call Silver.com at 1-888-989-7223. We would also be glad to assist you online through live chat or email.